Can Help You Ace It! 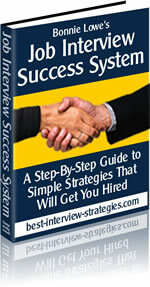 Have you ever thought about the pre interview strategies you are going to use? Job interviews are not something you should waltz into unprepared. If your attitude is, "This interview is no big deal. If I don't get this job, I'll just get the next one," you're in for a world of hurt. Even the most charming candidate will seem lame compared to one who is professional and totally prepared. Because you're here at this web site, you've already proven you have a strong desire to go above and beyond what most job seekers do. You realize that preparation is essential to success. So let's get busy. Your answer must be yes, or you wouldn't be interested in job interviews. But have you given much thought to the quality of the change you're about to undergo? Are you just looking for a job, or eager to build a career? A journey is easier if you know the destination at the beginning. PRE INTERVIEW STRATEGY #1: Find work you will love doing. This is the most important strategy you can implement, because it affects all other job-hunting actions that follow. But it's something most people don't give enough thought to. Some of us tend to "fall into" our career paths without much planning, mainly because we don't know what we want to be when we grow up! This doesn't mean you should put your plans on hold until you determine your true "dream job." It may be better to go into a field you're not sure about and end up quitting after 6 months than to do nothing. Sometimes you don't know what you want to do until you try a variety of things. For some tips to help you determine what work you will love doing and the best career path for your interests, skills and desires, go to the Career Planning page. PRE INTERVIEW STRATEGY #2: Research the company. The company's reputation. Is this a company you'd be proud to name as your employer? The company's benefits. Salary isn't everything, and sometimes you won't know what it is until you are hired and negotiate an amount. But most companies will tell you about the other benefits they offer, such as pension plans, vacation and sick leave, health care programs and so forth. The company's mission, vision and goals. Find out as much as you can about what the company does and how it does it. Search the Internet to see if the company has issued any press releases recently, and read them. Knowledge is power, and in this case, the more you know about the company, the better off you'll be at the interview. You will stand out among the candidates -- whoever interviews you will be impressed that you took the initiative to do this, because most job seekers do not. PRE INTERVIEW STRATEGY #3: Study the job description carefully and make sure your application and/or resume compliments what the company is looking for. You should not have a generic resume that you submit for all job openings. You want one that matches your talents and skills to those desired by the company for that job. In other words, if the job announcement makes it clear that someone with strong accounting skills is needed, be sure to highlight any accounting or bookkeeping duties you've done in the past, even if they were a relatively minor aspect of your previous jobs. Don't spend valuable space on your resume and application on skills they are not interested in. (I.e., if you're applying for a job as a ditch digger, don't tell them how great you are at organizing files.) Instead, emphasize how well you fit their idea of the best-qualified candidate for that job. PRE INTERVIEW STRATEGY #4: Prepare for questions that will be asked during the interview. By studying the job announcement, you should have a fair idea of what kinds of questions you will be asked. Some questions are generic in nature and fairly standard for most interviews, while others are specifically related to the position you hope to fill. Put yourself in the hiring person's shoes... what would YOU want to know about potential candidates? What kinds of questions would YOU ask to determine who would be best for the position and the company? Review this, but develop your own list of potential questions based on the position, and practice your answers. Also be aware that unexpected questions may be asked. Don't become flustered if this happens. Just remain calm, take a deep breath, and think before answering. PRE INTERVIEW STRATEGY #5: Prepare questions you will ask during the interview. Yes, in addition to ANSWERING questions, you should ASK some. This opportunity usually comes at the end of the interview, when their final question is, "Do you have any questions for us?" Of course you do! Most job seekers do NOT have questions, so here's another opportunity for you to set yourself apart from those other candidates. PRE INTERVIEW STRATEGY #6: Visit the interview location a day or so before your interview. There's nothing more stressful than getting lost and being late for your interview. Before the interview date, find out exactly where you'll be going, where you will park, and how long it takes you to get there (consider the time of day and traffic impact). This dry-run will ensure you'll be there right on time when it counts. PRE INTERVIEW STRATEGY #7: Plan what to wear to your interview. Yes, this seems like common sense. But some people don't think about what they're going to wear until the morning of the interview. Then they scramble to find something that's appropriate and clean. Imagine putting on that rarely used suit an hour before your interview and discovering that it no longer fits! Plan your outfit in advance, try it on to make sure it fits well, and get it cleaned and pressed if necessary. When deciding what to wear, think "conservative business attire." Even if you are interviewing for a field job in which you'll wear jeans and steel-toed boots, those clothes are not appropriate for the interview. It's always better to dress "up" than to dress "down." The key is to look professional. Here are some preparation tips:(1) Think about your hair in advance and make sure it's as ready for the interview as your clothes. Do you need a haircut or touch-up on the color? (2) Do not plan to wear perfume or cologne. Having no noticeable scent is better than turning your interviewer off by wearing too much perfume/cologne (or wearing a scent that unpleasantly reminds an interviewer of his/her ex-spouse). It's safest to wear no scent at all. (3) Women, if you decide on a dress or skirt, make sure it's not too short. Be conservative, remember? (4) Same goes for shoes... chose a pair that are stylish, but conservative and comfortable. Make sure they're clean and/or shined. PRE INTERVIEW STRATEGY #8: Plan what to bring to your interview. At a minimum, bring a few extra copies of your application and/or resume. If you have letters of recommendation, bring copies of those, as well. If you don't have any letters of recommendation but have time to obtain some from your past employers or character references, do so -- even if you have to speed things up by writing them yourself and then getting permission from your references to sign their name to them. Having letters of recommendation ready to hand out at the interview will give you another leg up on your competition, and make you stand out among many applicants. If appropriate for the position, considering bringing a portfolio with examples of work you've done. In all likelihood, there won't be time for you to show your work during the interview. But perhaps you can leave your portfolio and pick it up later, or provide copies. Now, Good Luck on your interview!